The android characters of the first two films in the Alien franchise are perhaps its most intriguing. The first was a cold hearted company man, the second a gentle yet brave scientist. On the surface, they were deceptively human. A closer look revealed that something was clearly missing. The first Alien visualized this revelation with perhaps one of the most shocking and icky plot twists in science fiction history. The upcoming Prometheus plans not only to explore the origins of the deadly xenomorph, but of the artificial people that have played such a major role in the Alien mythology. The latest viral video gives us a glimpse into Weyland industries greatest triumph. 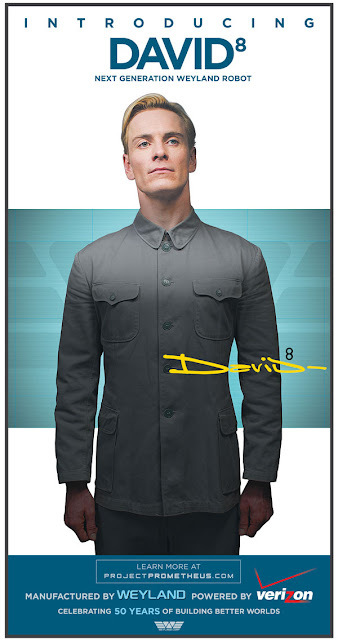 Happy Birthday David is essentially a commercial for the 8th generation David, a predecessor to ash from Alien. David is a wondrous creation indeed. He can appreciate beauty. He can give his own personal interpretations of abstract images. He has the ability to think, reason, and understand. He does not, however, have the ability to feel. Per his own admission, he claims to be able to carry out directives that his human counterparts might find”…distressing or unethical.” David has all of the best qualities of the human mind and none of its pesky drawbacks. Weyland industries claims to be merely making robots that are more lifelike and less robotic. In reality (the fictional reality of Prometheus and the Alien films, of course), It seems that they are actually trying to improve on humanity. Weyland has created the perfect sociopath, one that can follow orders and is able to be programmed. David suggests that man sees his own sensitivy and empathy as a hindrance to progress and betterment. Just as Ash described the xenomorph itself, these androids are “unclouded by conscience, remorse, or delusions of morality.” Religious types will correctly see them as an abomination, an example of man playing God by trying to improve on God’s greatest creation. That ties in nicely with the themes of the film. Such ideas are perhaps more disturbing than any number of gory visuals and jump scares that Sir Ridley Scott may trot out.